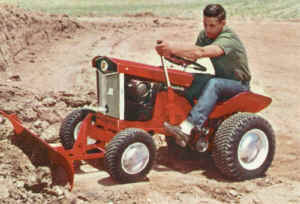 36" LAWN ROLLER (Mfg. No. 990227) Landlord with 36" lawn roller. 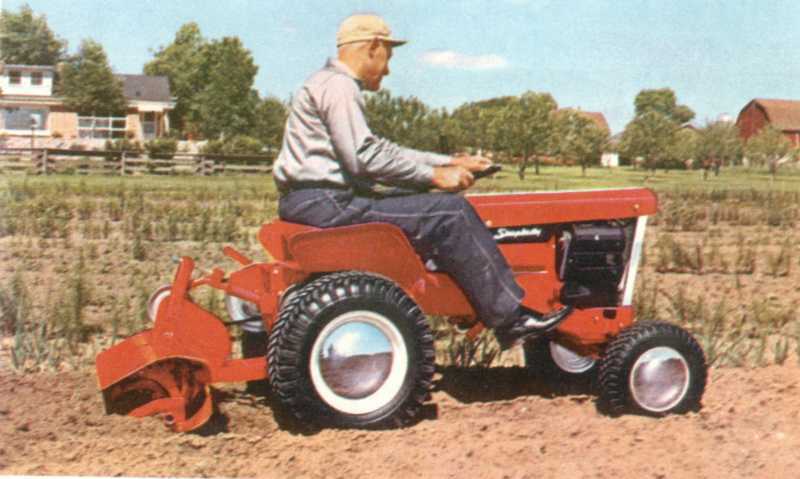 Easily attached with just one pin, yet covers the wheel span of the tractor and weighs 370 lbs. when filled with water. Spring-loaded scraper blade cleans roller surface during operation. 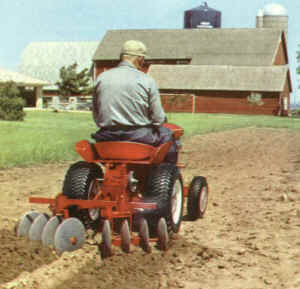 32" ROTARY TILLER (Mfg. No. 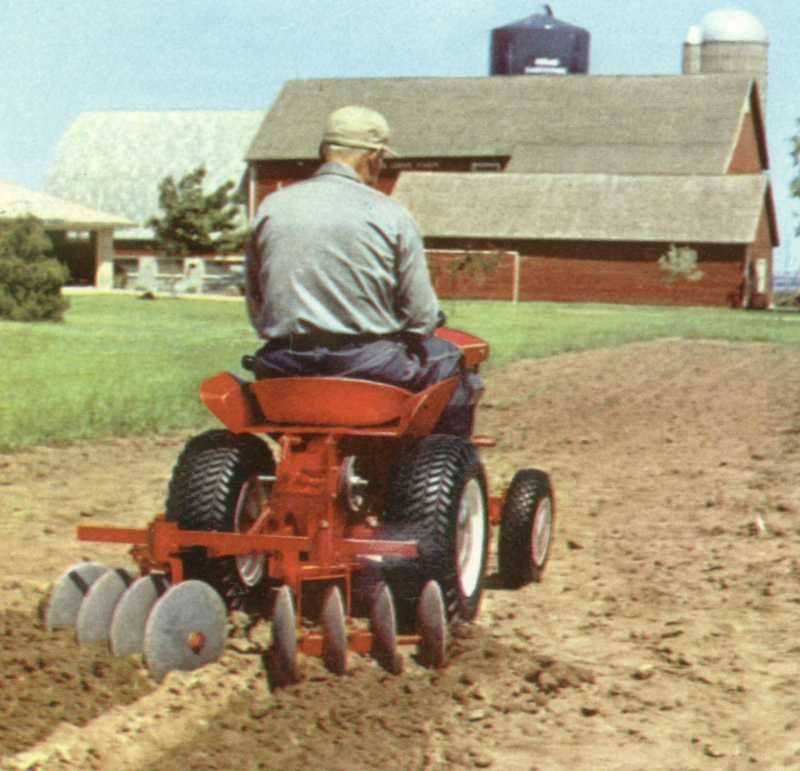 990174) Gentle blending action prepares ideal seed beds, since it never pulverizes soil structure. Strong, non-clogging, self-sharpening tines. Precision anti-friction bearings. EASY LIFT lever raises when desired. (Recommend No. 990223 front counterweight for balance and easy lifting.) Pulley kit No. 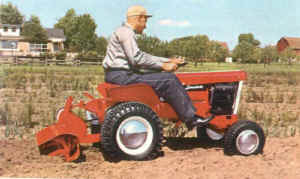 238 reduces tractor speeds. 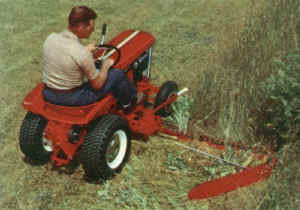 Extension tines No. 990212 optional, increase tillage width to 42". SUMMER CAB (Mfg. No. 990283) Protected from the searing stare of the sun, you've got it made in the shade. Just eight bolts attach tubular steel bracing to the frame. And unique Lift-O-Dot Snap Couplers secure the fabric in seconds. 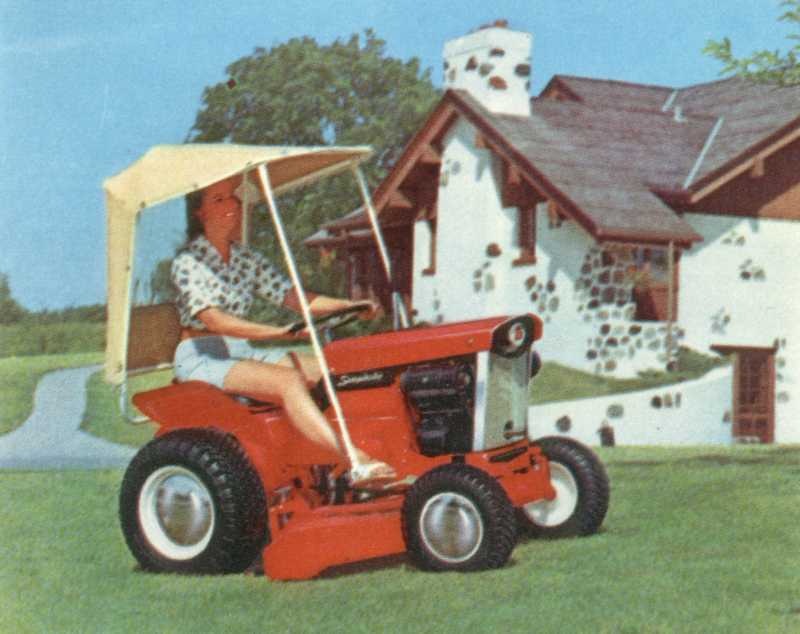 Lots of headroom, excellent visibility all around, yet you're in the shade at all times. 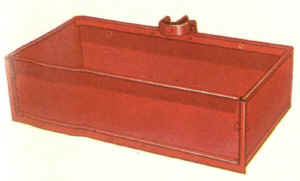 CARRY-ALL BOX (Mfg. No. 990274) Does just what its name implies. Easily carries 350 lbs., yet attaches to the Landlord with only three pins. Removable tail gate for loading ease. Heavy 16 gauge steel box and heavily reinforced supporting structure shrug off heavy, constant use. Only 10" deep and measures 20" x 40", it stores in a small space. MOBILE ALTERNATOR GENERATOR (Mfg. No. 990220) 1500 watts, 13 amp., 115 volts, 60-cycle with volt meter. Start motors that normally require 2500 watt generators, delivers a 30 amp. current for 20 seconds, 20 amp. starting current for 2 minutes. For driving electric lawn mowers, hedge trimmers, pruning equipment, power saws, stand-by power. DUMP CART (Mfg. No. 990085) Leave the heavy hauling to this welcome attachment. 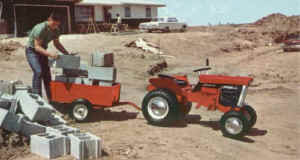 Hauls 1000 lbs. easily. Can be completely tipped without disconnecting the trailer hitch or lifting trailer wheel from ground. Balanced for easy dumping. Heavy-gauge steel, completely reinforced. Detachable tail gate. Attached without tools. Size 39" x 26" x 12". HEART OF LANDLORD'S NEW HYDRAULIC LIFT KIT (Mfg. No. 990339) Brand new feature multiplies your muscle-power, gives you a hydraulic lift when raising front, center or rear-mounted attachments. 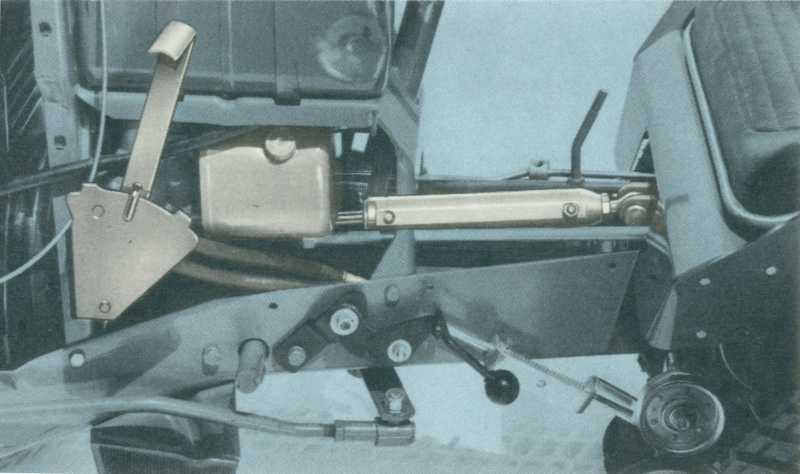 Allows attachments to be raised or lowered to any position with as little effort as "power steering." Electric Light Kit: Two 12-volt sealed beam lights. Mfg. No. 990318. 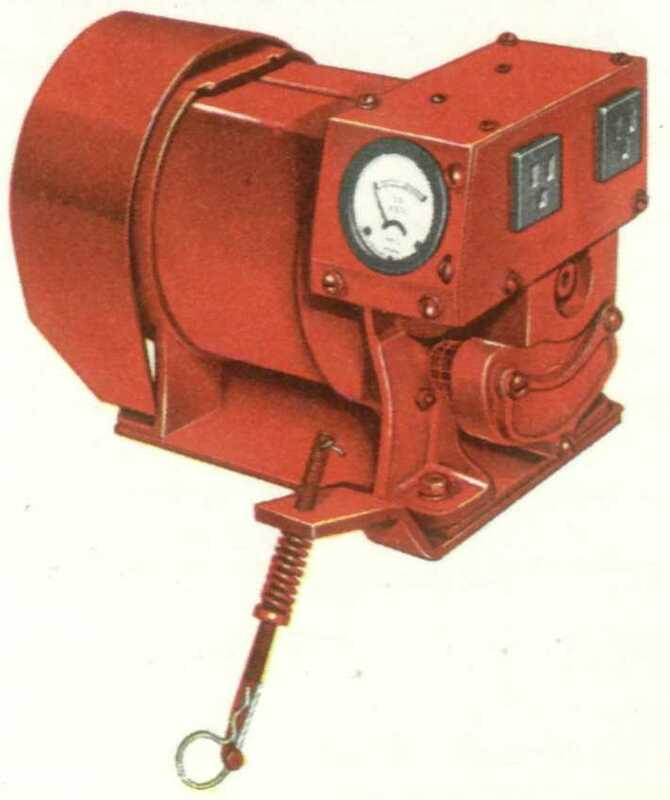 Electric Starter Generator. Includes 12-volt battery. Mfg. No. 990316. Dual Wheels: For extra traction and stability. Mfg. No. 990286. Tire Chains: 8-12, pair. Mfg. No. 990315. Speed Reduction Kit: 10" pulley and belt reduce normal speeds to increase power. Use for Snow Thrower in heavy snow, and with Rotary Tiller for deep tilling. Mfg. No. 990238. Hub Caps: Set of 4. Mfg. No. 990280. Dual Lift Lever Kit. Mfg. No. 990312. Front Counterweight. 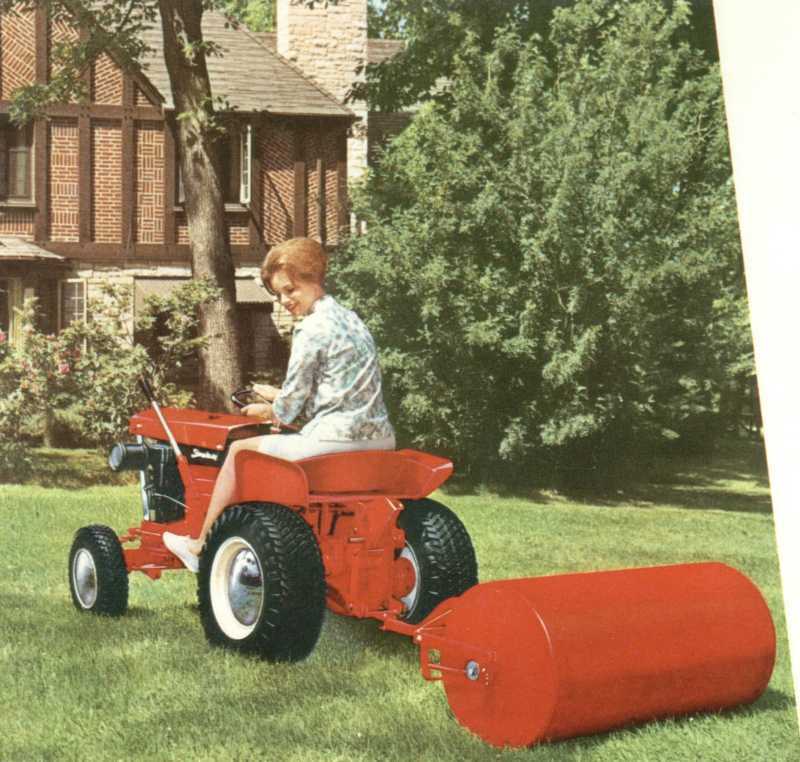 Recommended for use with heavy rear-mounted attachments. Mfg. No. 990223. Hitch Adapter necessary for Moldboard Plow, Disc Harrow, or Cultivator Blade. Mfg. No. 990203. 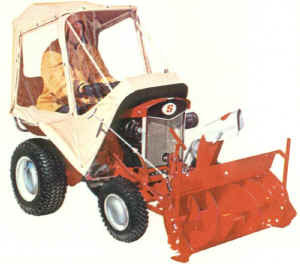 Rear Counterweight for Snow Thrower Mfg. No. 990182. Collar Weight for Snow Thrower and Dozer and Dozer Blade. Mfg. No. 990045. Wheel Weights. Mfg. No. 990046.